Pregnancy is one of the few times in life when hair growth is sustained for around nine months. Normal hair growth cycles follow a 90/10 ratio. 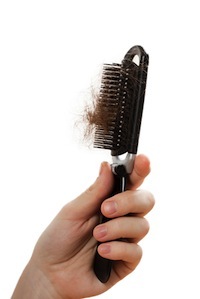 About 90% of the hair follicles are in the growing state at any given time. The other 10% is in a resting state – the state when hair loss occurs. During pregnancy, estrogen supports constant hair growth, but that extra thickness does not stick around long after baby is born. After conception, estrogen levels rise and stay elevated for the remaining months of pregnancy. During this time hair follicles are held in a constant state of growth. The resting phase that allows small amounts of hair to shed is postponed, so pregnant women retain hair that would normally fall out and continue to grow new hair. This leads to thicker, fuller hair. When estrogen levels drop after delivery, the hair growth cycle attempts to return to normal by shedding excess hair quickly. New mothers may not notice changes in hair growth cycles immediately after birth, but about three months after delivery the hair growth cycle quickly resolves to a more normal growth/shed pattern, which means all that excess hair falls out – sometimes all at once. Hair loss is gradual for some new mothers and nearly instant for others. By the time baby reaches one year, the extra pregnancy thickness and fullness is gone and hair growth cycles are back to normal. Can Other Reproductive Issues Cause Hair Loss? Estrogen is the hormone at play in hair growth and hair loss. Any reproductive or non-reproductive issues or medications that affect estrogen levels will likely cause changes in hair growth and hair loss. Women can expect to lose extra hair when they stop taking hormonal birth control pills that contain estrogen, after a miscarriage, stillbirth or abortion or if they suffer from an estrogen imbalance of any kind. Natural and surgical menopause may also contribute to extra hair loss. During pregnancy avoid hairstyles that pull hair tight, including corn rows, extensions and tight ponytails. Eat fruits and vegetables that contain lots of fiber, flavonoids and antioxidants to protect hair and increase growth. When hair is wet, brush through tangles and tight spots gently to avoid damaging the hair follicle or root and remember to take your prenatal vitamin. Hair loss after giving birth can be scary, especially if your body sheds the extra pregnancy growth all at once. Rest assured, all pregnant women shed hair between three and six months after baby is born. Hair growth patterns are simply returning to normal.